For a youngster, son of Orthodox Russian parents, growing up in the Jewish, Roxbury section of Greater Boston it was a prescient act of defiance and profanity. 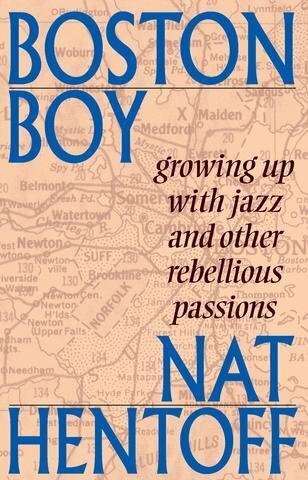 It was a defining moment which the author of 30 books, jazz critic, and leftist journalist would return to at intervals in Boston Boy his 1986 memoir. Nathan Irving “Nat’ Hentoff (June 10, 1925 – January 7, 2017) passed at 91 some time ago. Why then, in the waning moments of 2018, review a book written some 32 years ago? His lively memoir, rich with insights and colorful anecdotes, surfaced during research for my sixth book. While it pales by comparison to Hentoff’s thirty plus books, Counter Culture in Boston: 1968 to 1980s, aspires to expand acccounts of that era. Having broken into the jazz world and journalism Hentoff quotes another legendary Boston boy, jazz critic and columnist George Frazier (1911-1974), as “joining the varsity team” by moving to New York in his late twenties. There Hentoff became an editor of Down Beat, the jazz magazine. He was a columnist for The Village Voice from 1958 to 2009. He was a staff writer for the New Yorker and free lance contributor to many newspapers and magazines. As a teenager and student at Boston Latin School he covered anti Semitism for Frances Sweeney’s muckraking weekly The Boston Reporter. Dedicated to investigative journalism, and focused on corrupt Boston politics, the publisher/ editor who died young, accepted no advertising. Hentoff emulated her values and the book is dedicated to Sweeney. He also broke into general assignment and sports reporting for WMEX (launched in 1934). The “varsity” metaphor of Frazier/Hentoff implies that Boston is minor league or junior varsity. There was a similar motivation when I moved to Manhattan in 1966 but returned home, via New Orleans, in 1968. This year the Red Sox beat the Yankees and went on to win the World Series. In sports Boston teams have quite often been second to none. In most aspects of the arts, however, particularly theatre, opera, dance, museums and the fine arts there's no contest. In the niche of music and jazz it’s a different story. The Boston Symphony Orchestra is a world class organization. As I found during my years of covering jazz and rock, starting with a stint at the daily Boston Herald Traveler, all of the greatest performers passed through Boston’s jazz clubs and concert halls. It was possible to be a varsity jazz and rock critic working out of Boston. Now and then I took the shuttle to New York to cover a gig. It was usual to be on the scene most nights with midnight deadlines. As a kind of personal best I ran a streak of being in the paper every day for a couple of months. Nobody does that anymore. There was a sense of excitement overnight at the arts desk when critics pounded out copy to sprint to the rim. That meant two and a half takes (500 words with a lead) and two carbons. Having filed, often it was off to Chinatown then picking up the mailbag edition as it was dumped on the street. The leaded type, densely raised in relief, could be read like Braille. You got to read your stuff before catching some shut eye. Night work allowed for wandering back to the heam by mid morning. It’s how that ink gets into your DNA. Frazier preceded me covering jazz at the HT before Esquire. He returned to town as a Globe columnist. As Hentoff states, and I confirmed, Frazier was known for sartorial elegance matching his literary eloquence. Globe columns often related who at the time did or did not express the excellence and resonance of duende. After a gig at Lennie's on the Turnpike I encountered a soused Frazier in the small, cramped dressing room with Buddy Rich. Stripped to skivvies, with a towel on his head, the drummer answered my questions about playing Vegas and the Tonight show. Frazier mumbled the occasional comment. I was struck by his gorgeous attire and silk cravat. After that night he went on a bender holed up in a Southie motel near the Globe. As outed by Hentoff, Frazier was not a Brahmin but affected the mannerisms. Although a regular at the all male Locke Ober’s, where he routinely ordered the finnan haddie, while Harvard educated, he grew up in Southie. That was a generation or so prior to Whitey and the Winter Hill Gang. I came to Boston Boy eager for insights of an earlier time. There were compelling similarities and differences. While I never met Hentoff it is likely that our paths crossed during the raucous after parties in the “cottages” following performances at the Newport Jazz Festival. There were elegant blowouts sponsored by then prosperous record companies seeking influence over the assembled jazz artists and those who covered them. Compared to Hentoff, growing up in working class, immigrant, Jewish Roxbury, I was raised in upscale, Jewish Brookline. For grade school, with a few other Catholics we were bussed to Mt. Alvernia Academy in nearby Chestnut Hill. We learned catechism and basics of anti Semitism from Franciscan nuns within a stone's throw of Jesuit Boston College. Like the best and brightest kids Hentoff enrolled in Boston Latin School, the nation’s oldest, founded in 1635. My parents insisted that I commute to BLS and it proved to be an utter nightmare. Taking the rattler to school meant that there were no playmates from my neighborhood. With no girls to date that meant endless nights of homework. There were weekly tests in every subject and monthly report cards. The basics included six years of Latin, four years of French, English, math, history, etc. There were a couple of electives; a sophomore choice of German or Greek. It was said that “the better boys take Greek.” Kids headed for MIT took more science and math. It seems that Hentoff was one of the better boys. He applied to Boston College with the intent of majoring in Greek. He didn’t factor in a Jewish quota. Come spring, with no college for fall and late to apply, he matriculated to Northeastern. Faced with a similar conundrum, in a single day, I applied and was accepted by Boston College and Boston University. But ended up at Brandeis University of which my mother was an ersatz alumna having graduated from its precursor, Middlesex College of Medicine and Surgery. A great deal of Boston Boy deals with his conflicted relationship to Orthodox Judaism. He proved to be at least agnostic but imbibed of the traditions of Talmudic scholarship, skepticism, and outsider, radical, leftist politics. He rejected, however, the neighborhood barber’s attempts to recruit him into the juvenile branch of the Communist Party of America. Through the Freedom of Information Act he later obtained a redacted copy of his FBI file. There is a phenomenon of attrition at Latin School. There were six rows with six seats in classrooms. As a "sixie" (class six) that September, with several other students, I stood at the back of the class with Ritchie’s First Steps. Mr. Richards had us recite by rote “Amo, amas, amat.” By Thanksgiving, and the annual Latin vs. English football game at Harvard Stadium, there was an empty row in my homeroom. He asked if we had any questions about starting to study Latin. I asked "Will be learn to speak it?" That never happened. But might have if, as I told my mother, I wanted to be a priest. Thank God I got over that madness when I discovered girls. Seminarians don't date other than with each other. When I attended, it is different now and Latin School is even, good grief, coed, only one in four graduated. While every race and religion started, at the finish, the proportion of survivors became ever more Jewish. There was just one African American, Lowell Davidson, in my graduating class. We shared a love of jazz and I remember him talking with me about the unique lipping technique and embouchure of Duke’s trumpeter Clark Terry. Transition to the radical Jewish intellect of Brandeis proved to be relatively seamless. No matter what one majored in the commonality was dissent. We questioned everything and learned to trust no one. Particularly government. It was a perfect education to prepare for the Trump era. For Hentoff there was the arc from the Boston of James Michael Curley to the red scare of McCarthyism. Many of the remarkable Brandeis faculty had been blackballed as commies. It is how a very young university achieved the highest and more progressive standards of academic excellence. I attended lectures by Eleanor Roosevelt, journalist Max Lerner, author James Baldwin, CPA president Gus Hall, and Zen author Alan Watts. There were performances by Pete Seeger, Peter Paul and Mary while Joan Baez was a virtual classmate. That wasn’t the case at Hentoff’s bluecollar Northeastern but he was committed as a writer and editor of a muckraking student newspaper. It was disbanded when the paper undertook a planned exposé of anti Semitism among the board of trustees. Ever more involved in journalism, broadcasting, and leftist politics, Hentoff hung out at jazz clubs, particularly The Savoy. As previously stated all the greatest artists passed through. Even as a kid cats like drummer Jo Jones or sax player Paul Desmond took him to school. I had a similar experience talking with the legendary artists I wrote about. Particularly in clubs there was always easy access even from a jive ofay willing to listen. The artists proved to be amazingly generous in sharing a love of music. By the 1980s, when the music world became corporate, access was ever more controlled. It was no longer possible to wander into the green room and share a beer or reefer. Things changed for the worse when, as a condition of getting exclusive interviews, Rolling Stone agreed to letting management see and edit copy prior to publication. I have consented to that only on the rarest of occasions and always with regret. I saved a decimated copy of a piece I did on The Cars. What got published bore no resemblance to what I wrote. Perhaps one day I will frame and exhibit it as conceptual art. Jealousy surged when Hentoff discussed giants I never got to hear. Head throbbed and heart pounded a rhythm on my ribs when he discusses co-producing, with New Yorker critic Whitney Balliett, a 1957 CBS program. It was an all star broadcast (Coleman Hawkins, Ben Webster, Gerry Mulligan, Prez in the horn section) and the only time that Billie Holiday and Lester Young were filmed. He knew them and writes so poignantly about that session. While often in Lester's presence he never got to know the aloof and spooky tenor player. He got busted while in the Army. They say he was never the same after getting broken in the brig. It is always fascinating to listen to early Lester with Basie then those emotional, harrowing, melancholy later recordings. By then, they were both ravished by addiction. They were dead two years later. For the producers, who assembled several horn players including the big tenor of Coleman Hawkins, it was questionable if Prez could play. Seated, unable to stand like the other musicians, he performed a ballad "Fine and Mellow" with Lady Day in his signature, soft, gut-wrenching manner. It is one of the great moments of documented jazz. It was a stunning moment as the former great friends had intervening years of falling out. Lester regarded Billie’s mom as his own. Other than a Newport set it was the rarest of their reunions. The shots of Billie digging his riffs is utterly heart wrenching. The clip is available on Youtube. Truth is, I would have loved to learn more from Hentoff about the jazz scene. There are other sources with that detail. Richard Vacca’s The Boston Jazz Chronicles: Faces, Places and Nightlife 1937-1962 has a plethora of detail. As that book ends in the early 1960s, Vacca is currently collaborating with Fred Taylor on his memoir What and Quit Show Business. It will bridge from when Taylor came on the scene with the seminal tandem of the Jazz Workshop and Paul’s Mall on Boylston Street. In 2004, Newport Jazz Festival entrepreneur, George Wein, published Myself Among Others: A Life In Music. A native of Newton, he played piano gigs while a student at Boston University. The book discusses his clubs Storyville and Mahogany Hall (devoted to trad) in Copley Square. I first heard live jazz when my uncle Jim Flynn took me to Storyville at hear the Duke. Inspired by an Ellington composition the walls were painted black, brown and beige. Wein played intermission piano and often sat in during Newport jam sessions. While Boston is forever in the shadow of the Big Apple it retains a uniquely je ne sais quoi sensibility. Arguably, the scene is more compact, familial and achingly poetic. Unlike New York you don't need to have your game face on all the time. There is more room for agita and self reflection. Yes, there is a world out there, but like Marco Polo in Cathay, eventually you return home with gunpowder and Prince spaghetti. On Wednesdays Moms calls out to Anthony to come for dinner. How many times have I answered that call. Though not a perfect match, much of Hentoff’s Boston Boy could have been about me. So much feels the same. No I didn’t morph from klezmer clarinet to Artie Shaw and jazz. As a teenager, however, I glommed onto the same sides from Duke, to Satchmo’s Hot Five, Bix Beiderbecke, Basie, Kenton, Lennie Tristano, Bessie Smith, Sidney Bechet, Jazz at the Philharmonic, then later Bird and Diz, eventually Miles and Mingus, Ornette and on. Mostly though I dig the rad thing about Nat. It’s about Judaism and dissent. Adding a soupcon of Lenny Bruce humor and irony that sounds about right to this shabbos goy. "Just a note- Nat Hentoff wrote the liner notes to my famous recording of Dave Brubeck at Storyville"
"Here's the sports metaphor you are searching for: Each of you wrestling with what makes the modern world." "Fantastic, Charles! Thank you indeed for the historical perspective, but as well for the personal one. This was fascinating and perceptive, and rings so true to this ex-Brookline Jew." "I think a major difference was access. Jazz was completely segregated when Hentiff left Boston and even when you were growing up, well into the 60's blacks were excluded from the musicians unions and from white clubs. Much less so in New York. We did a vcr years ago on the hx of black jazz in New Haven wohtich was the stop up and down and the stories of Boston were horrific. The NY drug scene around NY was a major problem and Worcester, Springfield and Boston, along with New Haven, were spots you could cool down. Hentoff spent some time in this thread as I recall, though I never knew him until Brandeis and after when he had mellowed." "Charles my friend. After reading your piece certain things are becoming clearer. I'm referring to the question you asked about my ethnicity and religion You, Astrid and moi, were having night caps at your NAC digs when away from home. That night (six years ago) you asked me if was Jewish. It was an odd comment coming from one that I perceived to be humanist and a bit of an Italian-American Hell-raiser under the right conditions. You and I are too talmudic (think Tevya) for the average WASP to understand. The Jebbies are great teachers, debaters, and very 'laws' driven; not necessarily fans of the Arts. But there are always exceptions to all laws and rules right? That's where you and I met Arts-wise. Chicago ATCA 2012. For me, it's been a pleasurable, intellectual journey. I Love your writing and style. We share, to some degree, a gonzo, non-traditional orbit in the arts. Mazel Tov on your musical piece. I've just met a few of those you mentioned in you piece (lucky you)." "Amazing history lesson, Charles. I could feel being there. Thank you!"